I’m not the only one to write a book with cats as the star. Editor, features writer and author Melanie Whitehouse was adopted by her cat, Gus, in 2003. He inspired her book The Tail of Augustus Moon (2008, Book Guild), which tells the story of Gus’s adoption of journalist Maisie and his experience of the chaos that is a 40-something woman in search of a man. One thorough, scientific experiment later – well, a quick straw poll of a freelance women writers’ forum – and the results revealed themselves. Within minutes of posting up a question about cats, inspiration and how cats like to sit on your keyboard, I’d been inundated with responses. And an awful lot of fabulous pictures of cats curled up next to laptops, cats sitting in in-boxes, cats taking up room on top of notebooks. The overwhelming feeling was that cats make the writer’s life less lonely. In the main, freelancers work from home and the cat helps to make up for the lack of contact with human beings. Perhaps their company is even preferable to human colleagues – “Who needs annoying colleagues to chat to when you can talk at your cats who never make tedious small talk about train delays and the weather? !” as freelance journalist Isabel Mohan put it. 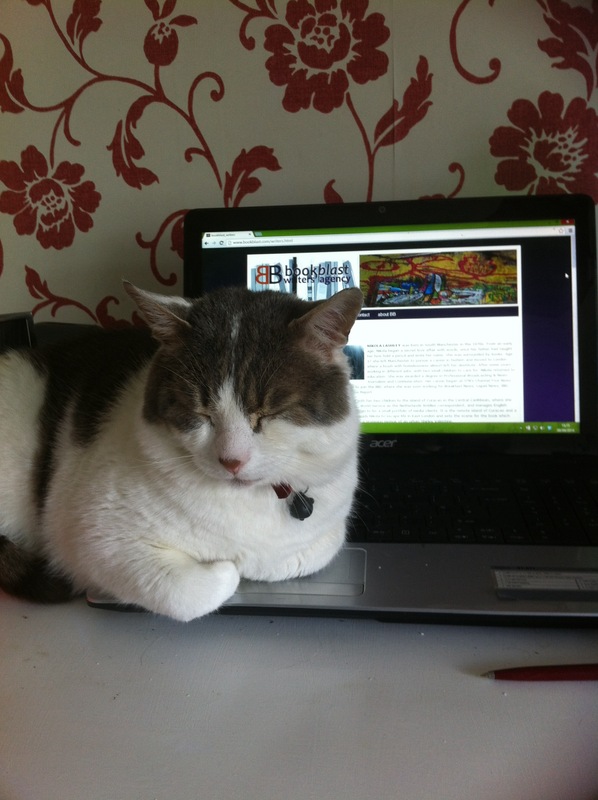 But the second most commonly-made point was the cat’s ability to disrupt work. From peeing in someone’s home office, to wandering across keyboards, sitting on the caps lock key (my cat Freddie’s favourite trick) and important bits of paper, draping themselves over the mouse – which seems entirely fitting – and snorting or miaowing loudly during important phone calls, the cat has nailed disruptive behaviour well and truly. And of course, most of us view the disruptive behaviour in a kind of “bad kitty, but soooo cute,” way. As my cat nudges my hand or sits on my notebook, I can’t help thinking how sweet and endearing it is. All work and no play makes Jill a dull girl, so I’m in agreement with freelance psychology, health and wellbeing writer Eve Menezes Cunningham who says she uses the distractions in a positive way – taking a moment to be more mindful through listening to her cat purring and stroking her gorgeous, soft coat. Enforced screen breaks were seen as another benefit and writer and illustrator Elisa Roche said her cat sometimes inspires her to ask for what she wants – and that cat-like attitude has won her a few pay rises over the years. I always know when I’m not inspired by a particular piece I’m writing because I always wander away from my laptop every few paragraphs or so to find the cat and give him some attention. And here’s a fun nerd fact for you from freelance journalist Tamsin Mackay – the cat emoticon you get on Skype is only achieved by pressing the keys C A T rapidly one after another. It was inserted as an Easter Egg code by the coder because his cat kept walking over his keyboard. So – we freelance writers LOVE our cats, even when they sit on our notebooks, walk across our keyboards and demand attention when we are doing our best to meet an imminent deadline. Maybe yours too has inspired artistic endeavours – books, photos, paintings, videos on YouTube or more – or perhaps you work as a freelance and suffer the frequent interruptions a pampered puss demands? We wouldn’t have it any other way, though, hmm?